Kotoku-In, not far from Hase Station, is the home of Kamakura’s most illustrious resident, the Daibutsu. Perhaps the most visited of all of Kamakura’s sights, a chance to see this humble giant sitting in the open air, surrounded by nature and people from all walks of life should not be missed. 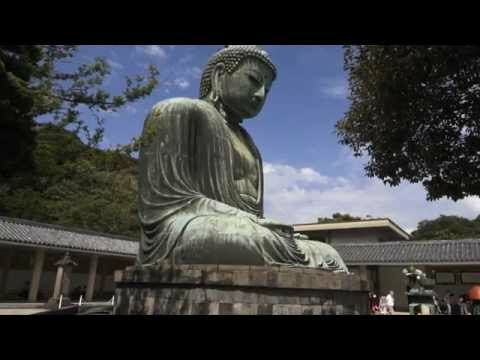 His gentle demeanor and pondering visage have touched the hearts of visitors for nearly 800 years, as far back as 1245 , when Kamakura itself is estimated to have been the world’s fourth largest city. Meditating throughout the centuries, he has weathered numerous typhoons, the siege of Kamakura (1333), the tidal wave of 1498 (which destroyed the temple he was housed in), the great Taisho Earthquake of 1923, and World War II. Extolled in both Japanese and Western literature and art, including a poem by Rudyard Kipling, the Daibutsu is surely one of the greatest remaining wonders of the Orient.